Experts now estimate that nearly half of cancers could be prevented by eating a healthy diet, getting regular physical activity, maintaining a healthy weight and avoiding tobacco and protecting yourself from sun damage. February is Cancer Prevention Month - a time to focus on healthy habits that can lower your risk for cancer and other chronic diseases. Getting more fruit and vegetable servings is one important thing you can do today. And it just got easier. 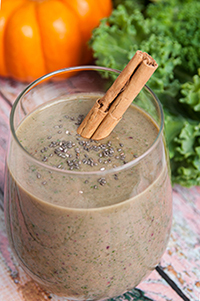 This nutritious breakfast smoothie combines leafy super greens, kale and spinach, with seasonal fruits, nuts and seeds for a cancer-fighting kick-start to your morning. Pumpkin will give you plenty of beta-carotene, a compound important in controlling normal cell growth and preventing cell damage from oxidation. 24 g carbohydrate, 13 g protein, 8 g dietary fiber, 111 mg sodium. Combine all ingredients in blender or food processer and blend on high until smooth. Let sit for 1 minute to thicken before serving.